Guacamole is the best and the easiest dip to make. 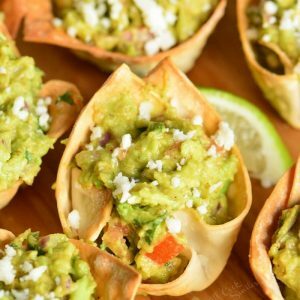 These Guacamole Cups are very simple and a perfect way to serve guacamole at a party. 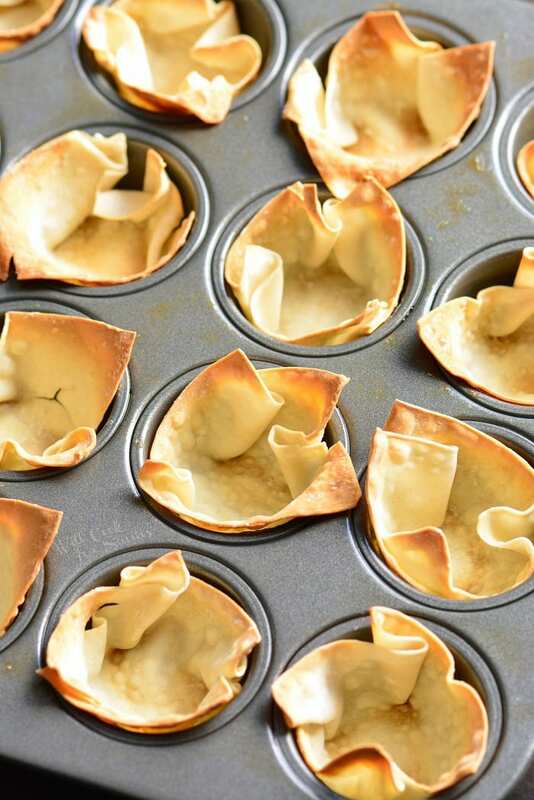 Crispy cups are made out of wonton wrappers and quickly baked in mini muffin pan. 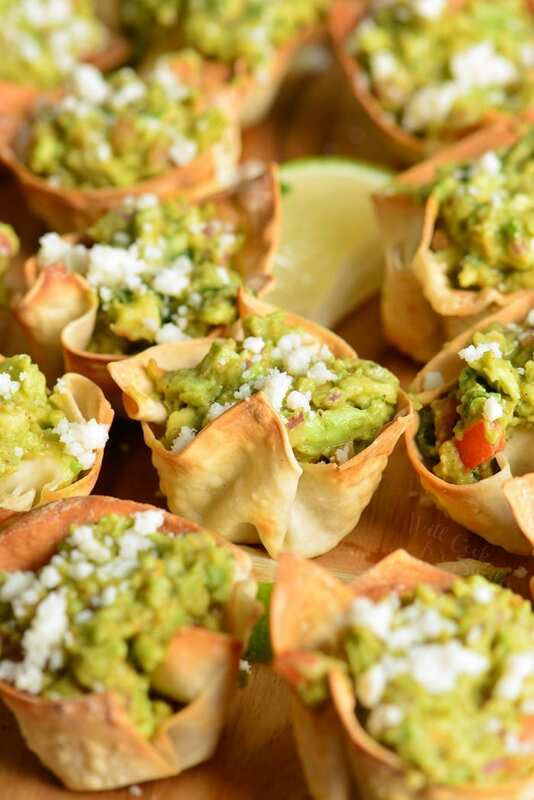 Then the cups are filled with guacamole and topped with some crumbled Cotija cheese. I highly recommend that you make your own guacamole using my family favorite recipe. If you want to try some more individual sized appetizers, my Mushroom Cheese Puffs and Chicken Enchilada Cups are always a hit. Guacamole is always a popular dip and quite healthy. My guacamole recipe is extremely popular with family and friends and it’s for a good reason. It tastes amazing! 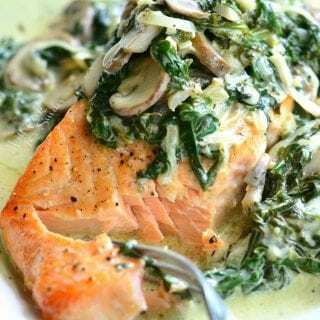 There are a few flavor additions that I always make that takes my recipe over the top. Besides adding veggies to the mashed avocado, I always make sure that I have a good amount of fresh lime juice, fresh cilantro, cumin, and chipotle chili powder. I love the smokiness that chipotle chili powder adds to the guacamole, so that’s a must add ingredient. 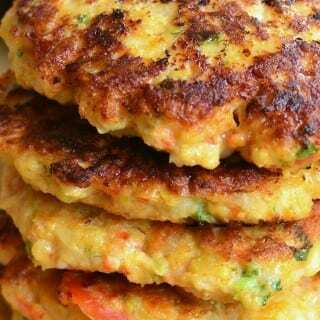 Vegetables can vary from time to time but those four ingredients are always present. Sometimes I add jalapenos to kick up the spice. Jalapeno itself can be mild of spicy depending on the age of the pepper. Older jalapenos are more spicy. There are people who refuse to add onions and tomatoes to their guacamole but I say, “bring it on!” It adds another layer of flavor to an already amazing dip. My husband refuses to buy avocados for me because he says he can never tell which ones to get. No matter how much I tried to teach him my tricks for picking avocados, he just won’t have it. It’s probably because he doesn’t eat avocados himself, but it’s really not that scary. It comes down to 2 basil things to look for, color and feel. First of all, don’t even look at an avocado that’s bright or even medium green in color. (We’re not talking Florida avocados.) You’re looking for darker green color with some wrinkles but not deep wrinkles. Deep wrinkles means that avocado is most likely over-ripe. Next step is to pick up the avocado and apply gently pressure in your palm. Don’t press hard with your finger tips or you will bruise the fruit. If they feel hard enough to seriously injure someone if you threw it, they’re not even close to be ripe. A ripe avocado yields when you gently press it. If it yields too easily, the avocado is over-ripe. Extra tip: years ago, my friend taught me another trick to check for avocado ripeness and that’s to look at the stem. The type of wrinkles around the stem and the color under the stem will help you determine if the avocado is ripe. If there are barely any wrinkles and the color is very light, the avocado is not ripe yet. If there are a lot of deeper wrinkles and color is dark and dull, the avocado is over-ripe. Those are the ones to avoid. My preferred method for keeping avocado from turning brown is lime. That’s all, that’s the big fat secret that will help keep your cut avocados and guacamole from turning brown. At least, that’s the method that works best for me. Once the avocado is cut, squeeze some lime juice from the lime onto the flesh and rub it all over. This will keep the avocados from turning brown for several hours. When it comes to guacamole, there are a couple of steps you need to do. Definitely fresh lime juice over the top first. Seconds step is to cover it with saran wrap by pressing the wrap directly onto the guacamole, inside the bowl. This will keep the air from directly hitting the guacamole surface and keep it nice and green longer. 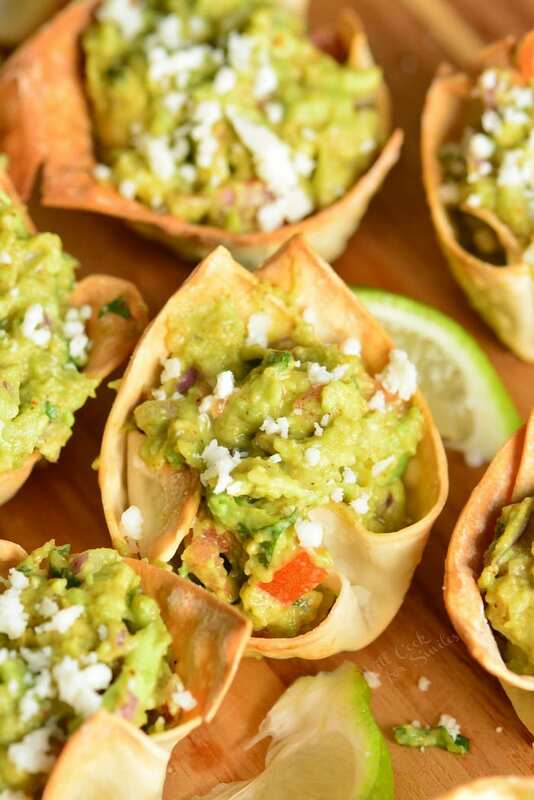 The cups are made out of wonton wrappers and quickly baked in mini muffin pan. 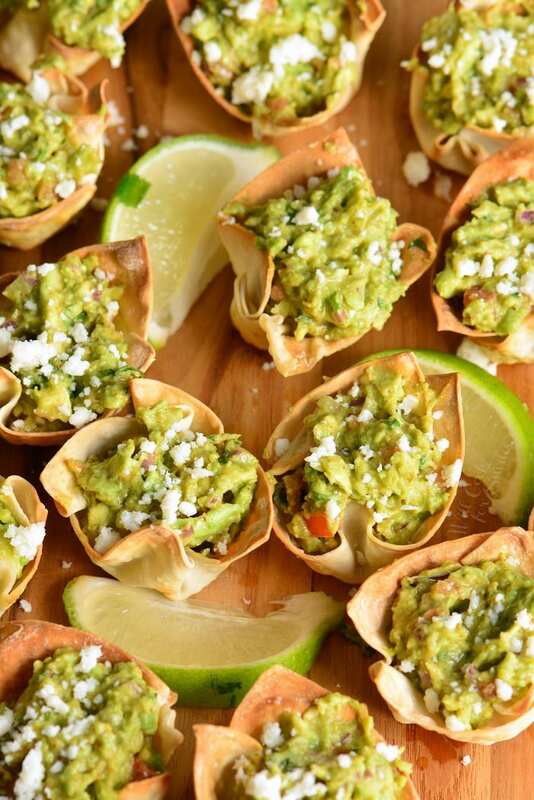 Then the cups are filled with guacamole and topped with some crumbled Cotija cheese. 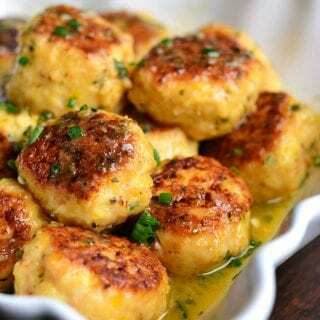 Preheat the oven to 375° and grease 24-cup mini muffin pan with some spray oil. Fit a wonton wrapper gently into each muffin cup of the pan to create little cups. Try to press/fold the wrapper folds onto the edge for a more even cup. Bake for about 7 minutes, until they turn golden brown. Take out of the oven. Let them cool enough to be able to take the cups out of the pan. Gently take out the cups and let them cool to room temperature. That won't take long. 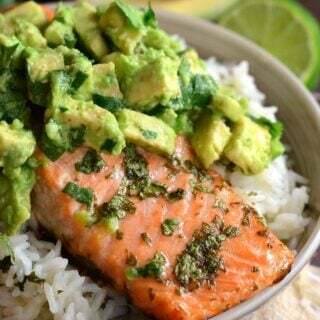 Cut avocados in half and scoop out avocado pulp into a mixing bowl and mash it with a fork. Seed and mince jalapeno. Mince red onion and dice tomato. Add veggies to avocado. Squeeze in lime juice and add remaining ingredients to the bowl, mix well. Taste to see if you need more salt. 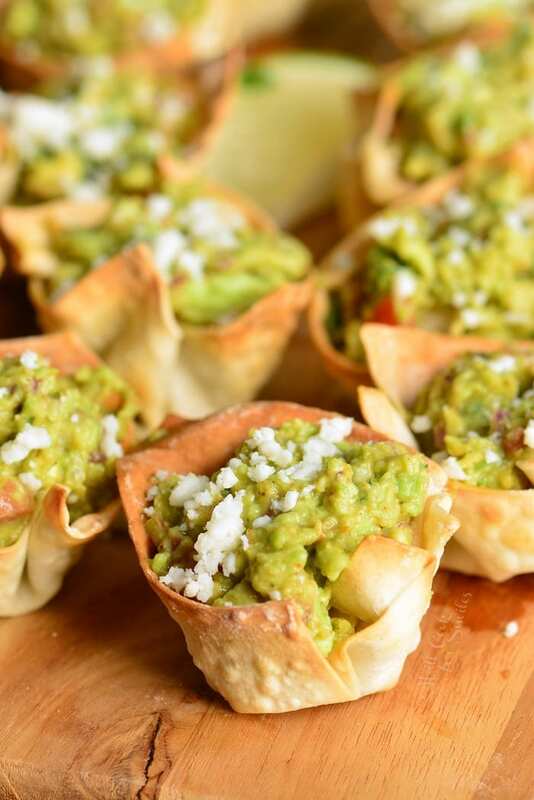 Fill wanton cups with guacamole and sprinkle some Cotija cheese over the top. Note: you can use more lime juice (from another lime) to squeeze over the top of each cup to keep it from turning brown longer. 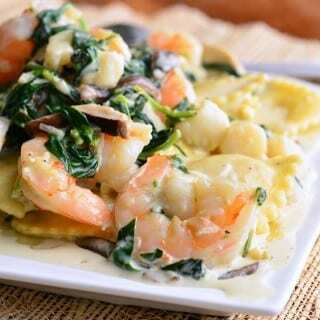 This is a great appetizer! 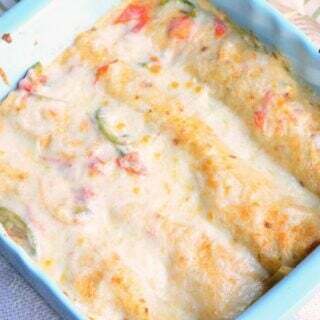 Only little change I made was to add the zest from the lime over top the cheese. Adds a little color and zing.